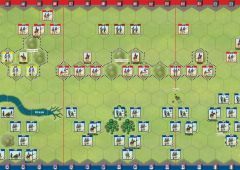 The green Command card deck, and red Tactician card deck from the Generals Marshals & Tacticians expansion, are used in all La Grande Battles scenarios. 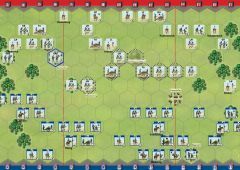 A La Grande Battles game is best played with eight players. One player on each side assumes the role of Commander in Chief (CIC) while the other players act as his Corps commanders. 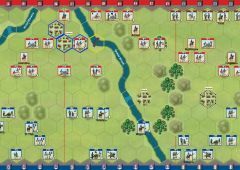 A La Grande Battles battlefield is divided into six sections (2 left, 2 center, 2 right). 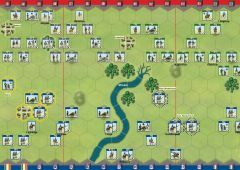 Each Corps commander is assigned two sections of a La Grande Battles battlefield (2 left or 2 center or 2 right) to command for the entire battle. The CIC does not have direct command of a battlefield section, but will hand out Command cards for his army and oversee and direct the battle. In a La Grande Battles game the CIC has a hand of Command cards per the scenario’s Battle Notes. Each Corps commander also has a hand of Command cards. 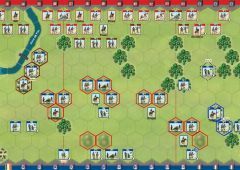 The number of Command cards each Corps commander will have at the start of a battle is also listed in the scenario’s Battle Notes along side of the scenario map. Deal the proper number of Command cards to each CIC and Corps commander at the start of the battle. 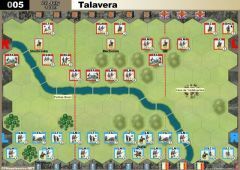 In a La Grande Battles game with 3 Corps commanders and a CIC player, each Corps commander will receive the number of Tactician cards as listed in the scenario Battle Notes. A Tactician card that a player holds may only be played on units in the sections he is commanding, but can be used against enemy units that are ordered against his units, even if the enemy units are not in his sections. 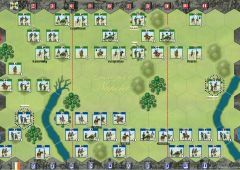 In a La Grande Battles game, each Corps commander will have or receive the number of Pre-Battle Russian Roll dice, Prussian Iron Will counters, or Spanish Guerrilla counters as listed in the scenario Battle Notes. 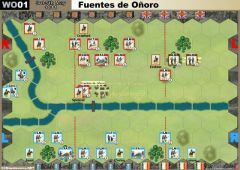 A Spanish Guerrilla counter that a Corps commander holds may only be played in an attempt to nullify a Command card played by his opponent in the sections he commands. 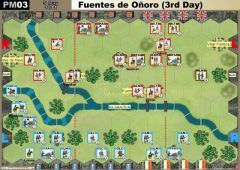 Note: When playing a Scout card, a Corps commander may only gain a Spanish Guerrilla counter, when a player’s battlefield sections he commands have at least four Spanish units. Each turn, the CIC will select a Command card from his hand and will also select one Command card from the Courier Rack. The CIC gives one card to one of his Corps commanders and will give the other card to one of his other Corps commanders. • The two Command cards selected must be given to two different Corps commanders. • Section Command cards must be given to the Corps commander in the section listed on the card. • Tactic Command cards (cards that do not refer to a specific section) may be given to any Corps commander. 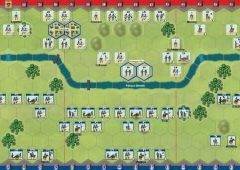 • Command cards that are received from his CIC, will order units across both of the two sections the Corps commander player commands. Exception: When the CIC gives a Force March card to a Corps commander, only infantry units in one section of the Corps commander are ordered. 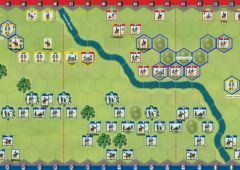 • A Multi-Section Command card (Recon in Force, Coordinated Advance, Flank Attack and Forward) is also given to a Corps commander in a La Grande Battles game. 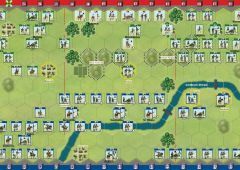 A Multi-Section Command card in a La Grande Battles game is not played face up in front of the CIC, as in the EPIC rules; it is given to a Corps commander. A Recon in Force Command card will order one unit in the Corps Commander’s left section, one unit in the Corps Commander’s right section and the order for the unit in the center can be given to a unit in either section, left or right. The Recon in Force card will therefore order 2 left and 1 right or 1 left and 2 right units. 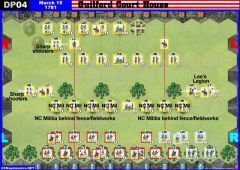 A Coordinated Advance Command card will order one unit in the Corps Commander’s left section, one unit in the Corps Commander’s right section and the two orders for the units in the center can be given to a unit in either section, left or right. The Coordinated Advance card will therefore order 3 left and 1 right or 1 left and 3 right units. 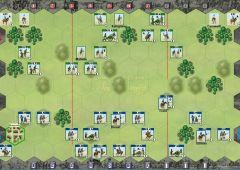 A Flank Attack Command card will order two units in the Corps Commander’s left section and two units in the Corps Commander’s right section. 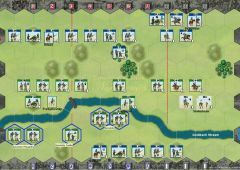 A Forward Command card will order two units in the Corps Commander’s left section, two units in the Corps Commander’s right section and the two orders for the units in the center can be given to a unit in either section, left or right. The Forward card will therefore order 4 left and 2 right or order 2 left and 4 right units. EXAMPLE: The CIC gives his Right Wing Corps commander the Forward Command Card. The Corps commander can order two units in his right section, two units in his left section and use the other two for either section. • When the CIC gives a Command card to a Corps commander that orders units Equal to Command, the number of Command cards is the number of Command cards in the CIC player’s hand, including the Command card just played. • When the CIC gives a Take Command card to a Corps commander, ordered units may extend into another section, even a section commanded by another Corps commander, but a unit may only be ordered one time during a turn. • A Corps commander does not like the Command card given to him by the CIC. He may choose to discard the CIC’s Command card and instead play one of the Command cards he has from his hand. • A Corps commander does not receive a Command card from the CIC, he may choose to play one of his Command cards from his hand. 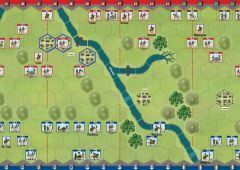 • A Left Section Command card must be played in his left section and only orders units in his left section. 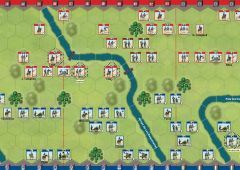 • A Right Section Command card must be played in his right section and only orders units in his right section. 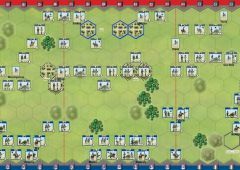 • The Corps commander chooses whether a Center Section Command card will be played to order units in either his left section or right section. 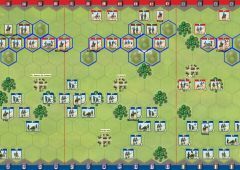 • A Tactic Command card (cards that do not refer to a specific section) will order units across both of the two sections the Corps commander commands. A Force March Command card is an exception. 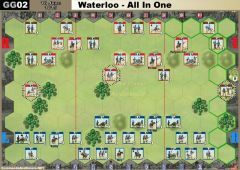 A Force March Command card played by a Corps commander will only order infantry units in one of the Corps commander’s sections. • A Command card that states Equal to Command, orders the number of units that is equal to the number of Command cards the Corps commander has in his hand, including the Command card just played. 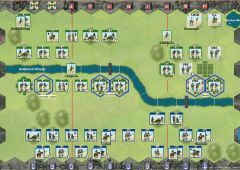 • When a Corps commander plays a Multi-Section Command card (Recon in Force, Coordinated Advance, Flank Attack and Forward) a Multi-Section Command card is played as follows. ◊ A Recon in Force Command card will order one unit in the Corps commander’s left section, one unit in the Corps commander’s right section and the one order for the unit in the center can be given to a unit in either section, left or right. The Recon in Force card will therefore order 2 left and 1 right or 1 left and 2 right units. 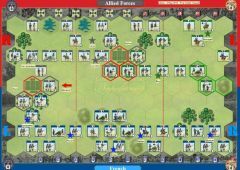 ◊ A Coordinated Advance Command card will order one unit in the Corps commander’s left section, one unit in the Corps commander’s right section and the two orders for the units in the center can be given to a unit in either section, left or right. The Coordinated Advance card will therefore order 3 left and 1 right or 1 left and 3 right units. 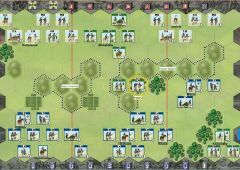 ◊ A Flank Attack Command card will order two units in the Corps commander’s left section and 2 units in the Corps commander’s right section. 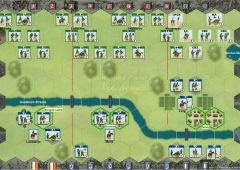 ◊ A Forward Command card will order two units in the Corps commander’s left section, two units in the Corps commander’s right section and the two orders for the units in the center can be given to a unit in either section, left or right. The Forward card will therefore order 4 left and 2 right or order 2 left and 4 right units. 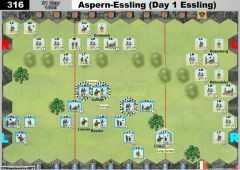 During a turn, when a Corps commander does not hold any Command cards in his hand, and does not receive a Command card from the CIC, he may act on his own initiative and roll two battle dice. The roll will determine what units are ordered in the sections he commands. • When two Saber symbols are rolled, however, no blocks are lost, instead the player will draw one Command card and add it to his hand. Pre-battle: After both CIC and all Corps players have been dealt their cards, five additional Command cards are dealt and placed face up in the Courier Rack so that those five Command cards are visible to all players. Each turn, one card is taken from the rack by the CIC player that is taking his turn, so the choice of cards a player has each turn is reduced, until there are only two cards remaining on the rack. The rack is then filled back to five cards before the next player’s turn, and the card selection process from the Courier Rack will start again. The Courier Rack will start the battle with 5 cards. The CIC and Corps commanders that just completed their turn will draw their Command card(s) first and then the cards on the Courier Rack are replenished. 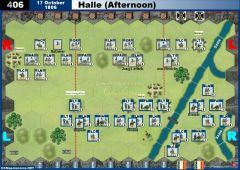 A CIC may not normally be able to play two Section Command cards in the same section, however, when all the Command cards on the Courier Rack and all the Command cards in a CIC’s hand are for the same section, the CIC after showing his opponent the cards in his hand, to confirm that all cards are for the same section, may play two Section Command cards in the same section on the turn. 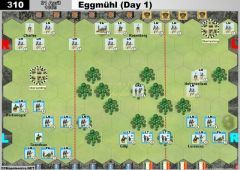 Command cards that have 3 Stars, will allow a Corps commander that is playing the Command card to order three additional units and/or leaders to make a March Move. • A unit or leader ordered to March Move, must be in the sections of the battlefield that the Corps commander commands. • A unit or leader ordered to March Move may not move adjacent to an enemy unit or leader. 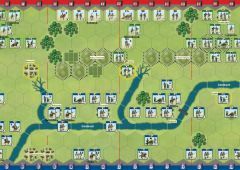 • A unit or leader ordered to March Move, may not have a combat card played on the unit or leader this turn. Important Note 1: When ordering units to March Move, it will be very important to track which units are being ordered normally and which units are ordered to March Move. 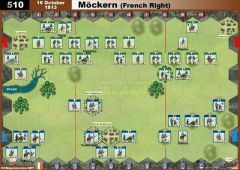 It is suggested that players use the battle dice to keep track, marking March Move units with a flag and other units with their symbol. Important Note 2: When a player does not order any units and/or leaders to March Move, the Corps commander may draw one Command card or draw one Tactician card at the end of the turn. 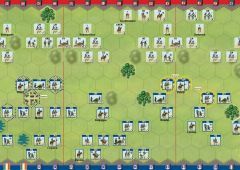 In a La Grande Battles game, the number of units that can be in square at the same time is equal to the CIC’s starting number of Command cards. 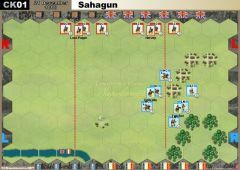 When a Corps commander wishes to form square with one of his units, place a numbered square counter on the unit and one of the Corps commander’s Command cards is drawn at random from his hand by his opponent. The Command card drawn from the Corps commander’s hand is placed on the army Square Track. When a Corps commander does not have any Command cards and the Corps commander wants a unit to go into square, he must ask the CIC for help. The CIC may refuse the Corps commander’s request or allow one Command card to be drawn at random from the CIC’s hand of Command cards. In this case, the Command card drawn from the CIC’s hand is placed sideways on the army Square Track space and the numbered square counter is placed on the unit. The rules for coming out of square remain the same for a Command card on the Square Track. When a unit comes out of square or is eliminated, a Corps commander’s card is returned to the Corps commander and a CIC’s Command card is returned to the CIC’s hand. In the case where Square Track spaces #1 to #4 already have cards, place square counter #5 on the unit going into square and set the Command card selected next to the #4 Square Track space. 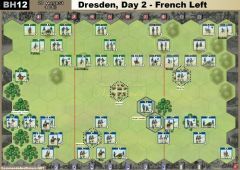 The same procedure is followed when the army already has five units in square. Place square counter #6 on the unit going into square and set the Command card next to the fifth place Command card. A CIC may not use the last Command card he has in his hand to form a square. A CIC must always hold at least one Command card in his hand. 2. When one or more Scout Command card(s) are played on a turn, the CIC will draw two cards instead of one, choose one to keep for his hand and give the Command card not kept to any of his Corps commanders to add to the Corps commander’s hand of Command cards. 3. At the end of a turn, when the Command card played instructs a player to draw a Tactician card, the Corps commander that played the Command card will draw a new Tactician card and will add it to his hand. 4. When an Elan card was played by any player on either side, at the end of that turn after the decks of cards are shuffled, all Corps commanders on both sides will draw one Tactician card. NOTE: When the Elan card is played any cards on the Courier Rack are not shuffled into the Command card deck. The cards remain on the rack. Scratch my previous post ... from my last re-read of the rules, I now appreciate that there is a distinction between a card received from the CiC and a card played from the Corp Commander's hand and that resolves my concerns. Seems complicated but presumably it's been worked out that the extra complexity is worth it for the game. Any one else think that there is a mistake in the LGB rules, whereby the CiC is supposed to give out "Section" cards according to Section named on the card, despite the Corps Commander being also restricted according to Left or Right within their section ? Has this has crept in accidently from Epics? In the LGB format, where each Corps Commander has their own pair of sections, it makes little sense to me. It leads to an odd situation where each flank commander will tend to get command cards for their outer flank, meanwhile disabling a key instrument in allowing the CiC to influence Corps Commanders, which is surely what this game should be about. That said, I can't find a forum post touching on this in the Epics expansion rules forum on BGG. Anyone else played LGB and noticed this oddity or can explain where I'm going wrong ? Dependent of the number of the CiC command cards. The austrian Battalion Mass refers to the square rules (only different, they don´t loose a card) and the (epic/LGB) square rules refers only to the CiC. How many Battalion Mass are allows under Epic/LGB rules? Is it the corps commander number of cards or corps commander plus CIC or what?